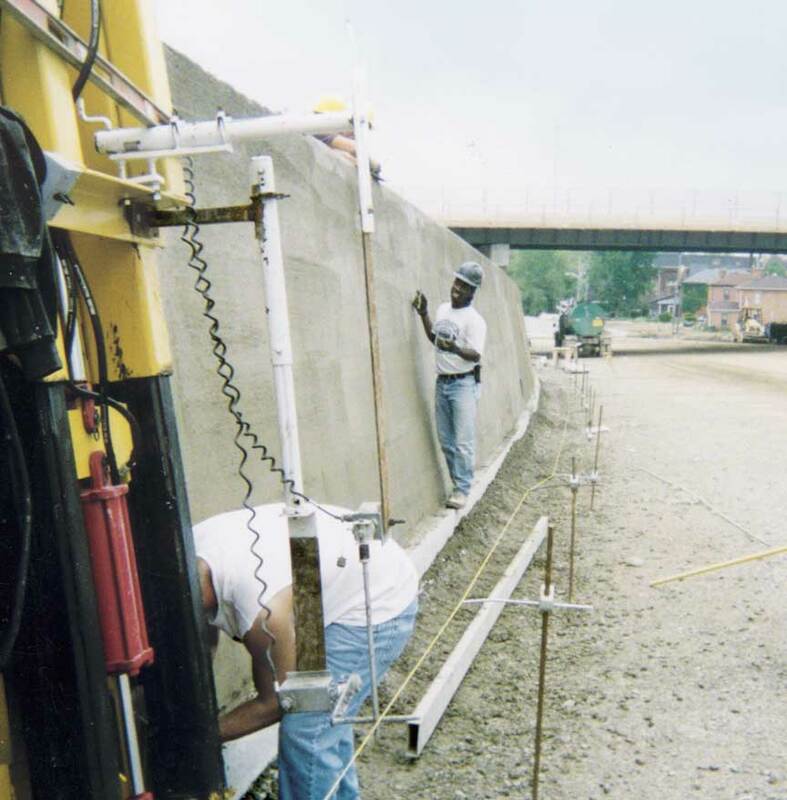 Complete General Construction in Columbus, Ohio, has owned GOMACO machines since 1970. They've tackled several challenging projects and successfully completed them. Last summer, they started work on a project that would take them to new heights on I-670 through downtown Columbus. The contract called for approximately 16,000 feet (4877 m) of barrier and parapet walls, including 420 feet (128 m) of 93 inch (2362 mm) tall wall with no caged-steel reinforcing. 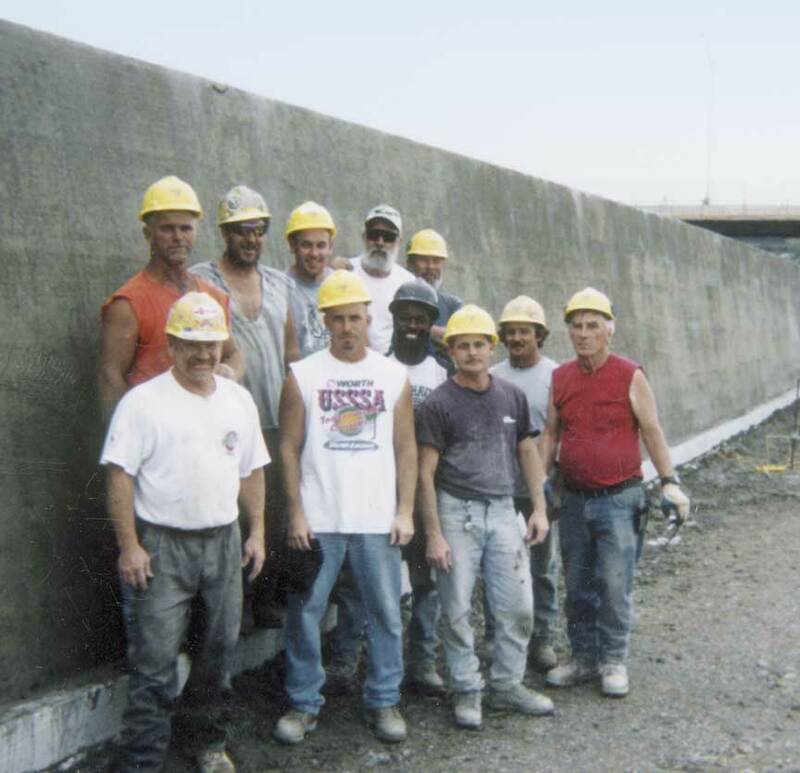 It could be the tallest barrier wall ever slipformed without steel reinforcement at 93 inches (2362 mm). "The most difficult aspect of the project had to be just trying to decide to slip the wall or handform it," Jeff Thompson, concrete division manager for Complete General, explained. "It was a gamble for us. 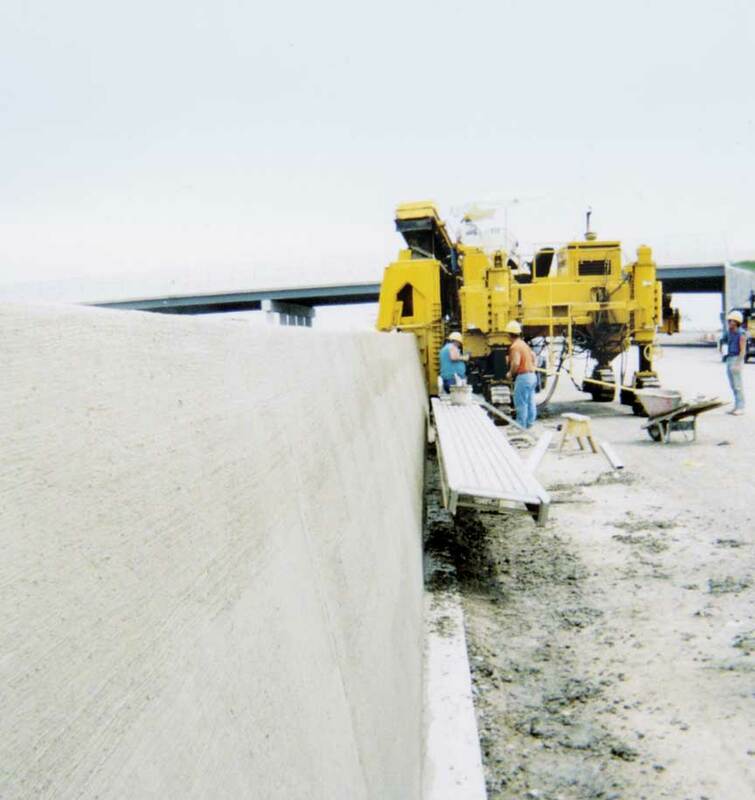 The wall design was a modified Ohio Department of Transportation 50 inch (1270 mm) single-slope, center-line barrier wall. In this tall section, it grew from 73 to 93 inches (1854 to 2362 mm) and we determined that it was actually more cost effective to slipform it than to handform and pour it." The company had experience slipforming wall, just nothing this tall. In fact, very few companies have experience with extremely tall walls. Complete General went to Indiana to consult with CRI Construction. The Indiana contractor successfully slipformed 104 inch (2642 mm) tall wall over steel reinforcing with their Commander III (GOMACO World Vol. 28, No. 3). Complete General would be using the company's old work horse, their Commander IV, to slipform the wall. "The Commander IV is the oldest paving machine we have right now and we just love it," Joe Kuhn, concrete superintendent, said. "It's just been so versatile for us and you wouldn't believe how many different operations we've been able to use it for. I knew it was the machine for this wall. "The biggest thing on a project like this is the concrete. You have to communicate with your supplier and make sure everyone's on the same page about the low slump, the consistency of the slump and the timely arrival of the trucks. You have to take into consideration that the machine and mold are a gimme. They're going to work, so the concrete is the only variable." They used an old-fashioned concrete mix design with no chemical additives, just a consistent low slump of 0.5 inches (13 mm). Ready-mix trucks were limited to 8 yd3 (6.1 m3) loads, too. "It helped with slump control," Thompson explained. "Unloading the trucks took 15 to 20 minutes and it took a truck and a half to go through the mold, so you basically had one-half hour that the concrete was sitting in the mold before it came out the back. The smaller loads could be controlled a lot better." The tall wall section of the project was slipformed in two days, moving at a production rate of only four inches (102 mm) per minute. "We didn't set any land-speed records on this pour," Thompson said. "It just took so much concrete to go 12 inches (305 mm) and we figured 12 inches (305 mm) of the new wall had to weigh two tons. It was slow, but we couldn't have handformed and poured it in two days." "It moved at a snail's pace but we sure got a good product out of our GOMACO machine," Kuhn added. "When you're standing next to a 93 inch (2362 mm) piece of fresh concrete slipped out, it's something to see. It really is." Complete General finished the entire wall project successfully and have since moved on to other challenges. This year they'll be slipforming 102 inch (2591 mm) wall, this time over steel reinforcing. "The Commander IV is just a nice machine and we'll probably own ours forever," Thompson said. "We've had great success with all our GOMACO products. On this wall, everything went off without a hitch and we had no problems slipforming any of the wall. In fact, I think we could add another 10 to 12 inches (254 to 305 mm) to the tall wall." 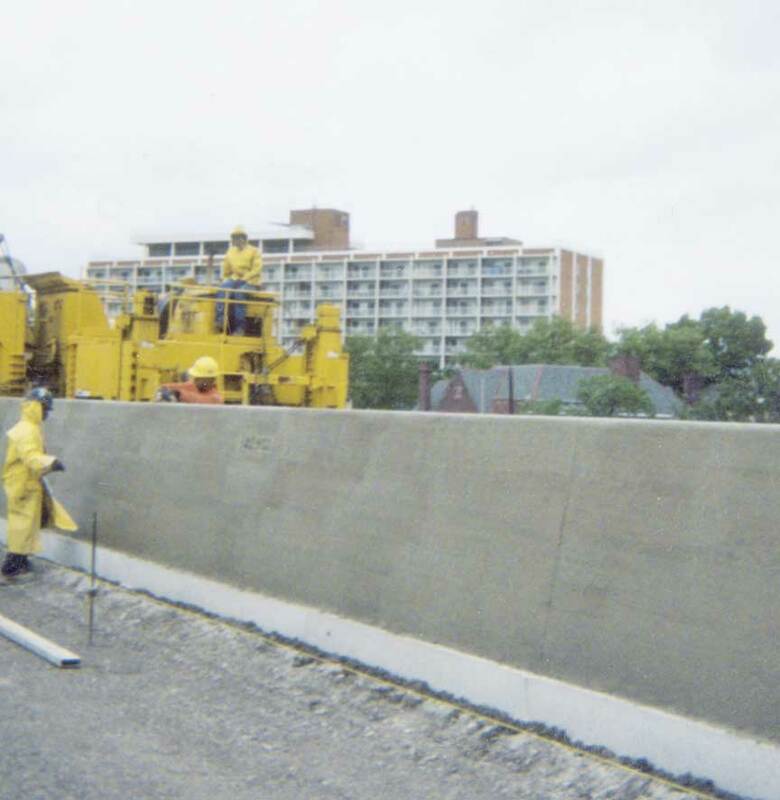 Editor's Note: If you know of anyone who has slipformed non-reinforced barrier wall taller than this, please contact me at kkrueger@gomaco.com. Complete General slipformed what could be the tallest section of barrier wall without steel reinforcement. The wall is 93 inches (2362 mm) tall.